A Day Dreamer's World: The Book Sacrifice Tag! It's been a while since I posted a tag on this blog - and by a while, I mean a few months, since my last appears to be from around mid-way through 2013. After seeing the original video posted by Ariel Bissett, I was so excited to be tagged by Zoe over at Bookhi to do this, as it seemed fun to decide which books to sacrifice in certain(hopefully unrealistic) situations. Before I begin dramatically reducing the amount of books on my shelf, by using them to protect my hair, I tag: Amber, Ruby and Sunny. An over-hyped book: Let's start this off with a Zombie Apocalypse! Let's say you're in a book store, just browsing, when BAM! ZOMBIE ATTACK. An announcement comes over the PA System saying that the military has discovered that the zombies' only weakness is over-hyped books. What book that everyone else says is amazing, but you really hate, do you start chucking at the zombies knowing that it will count as an over-hyped book and successfully wipe them out?! 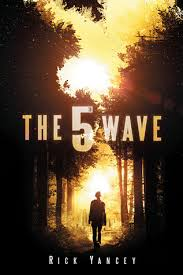 I picked up The 5th Wave by Rick Yancey due to the endless praise filling numerous blogs - and my Twitter feed - at the time. The reviews were all extremely positive, and when I saw this at my local bookstore, I thought I would also be writing a five star review. Sadly, I realised this book had been done before. Too many times. The story was so similar to those I'd already read and the book itself was filled with spelling mistakes I couldn't ignore. The characters were also unrelatable, with a very confusing narrative-style, and the plot was too complex. Since it's being made into a movie at the moment, I definitely think this one will work to wipe them out. A sequel: Let's say you've just left the salon with a SMASHING new haircut and BOOM! Torrential downpour. What sequel are you willing to use as an umbrella to protect yourself? This book is also the final one in a series, but sadly, the only sequel where I've found myself feeling disappointed after reading. Resist by Sarah Crossan felt like it was penned by a different author. I adored Breathe - and it is still one of my favourite novels - but I only rated this sequel a generous 3.5 stars. I was so excited to continue Alina, Bea and Quinn's story, which also had one of the most realistic ideas for a dystopia, but the sequel lost the heart of the first novel. A classic: Let's say you're in a lecture and your English teacher is going on and on about how this classic changed the world how it revolutionized literature and you get so sick of it that you chuck the classic right at his face because you know what? This classic is stupid and it's worth detention just to show everyone how you feel! What classic did you chuck? Before you start chucking hardbacks at me, I'll apologise. Sadly, I didn't like most of To Kill a Mockingbird by Harper Lee. I really enjoyed those final fifty pages, but apart from that, I had to force myself to read this novel. I wanted to adore this book. I wanted it to become a life-changing read, just like it is to so many people, I really did. I understand why most love Lee's novel, I do, but I wasn't one of these people. Your least favourite book of life: Let's say your hanging out at the library when BAM! Global warming explodes and the world outside becomes a frozen wasteland. You're trapped and the only chance of survival is to burn a book. What is the book you first run to, your least favourite book of all life. What book do you not fully regret lighting? I've never rated a book lower than 3 stars. I always choose books I know I will enjoy, or that I know has had good reviews. So, I struggled to pick out my least favourite book, especially since even the ones I didn't like as much were still "okay". 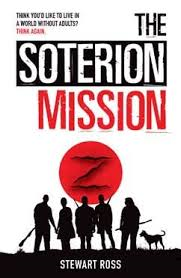 As I scrolled through my reviews though, I came across The Soterion Mission by Stewart Ross, and it was this one that stood out for me. It was trying to be the next best-selling dystopia but, completely missed its mark. You're about to go up on stage when you realise you're chewing gum. You have all your favourite series' backstage to steady your nerves before your performance and you realise you have to rip out the last page of the last book in one of your favourite series' to get rid of your gum because you can't go on stage chewing gum! What book do you choose to rip out the last page of? There have only been a few series' that I have actually finished. Many remain half-read on my shelf, with usually the final book left to collect dust. Thankfully, I've never disliked the ending of one of my favourite series', but there have been parts near to the end I'd have liked to have seen changed. I might be changing the question here a little, but I'd rip a few pages out of Twilight: Breaking Dawn, as I felt like the ending was anti-climatic. I wanted more. So, maybe those pages could be replaced with the film's ending? I loved how they executed it. Please understand that these answers are purely my opinion and do not set out to offend the authors, publishers or fans of these novels. So, what books would you choose in these scenarios? Do you agree with the ones I would sacrifice? Thank you! I wish I hadn't been so disappointed - but, you can't love every book! Same here! I always choose books carefully too! I don't know what to say in regards to 'Resist'. In my mind, it didn't feel like the same series; the writing was completely different! Hope you enjoy it if you do decide to read it, though! Great tag idea, although I have to disagree when it comes to To Kill A Mockingbird. I've not read any of the others ... I guess I won't be doing so any time soon! I always feel like the 'ugly duckling' when it comes to TKAM! I wish I'd love it like so many others do! Maybe I'll enjoy it more in the future!